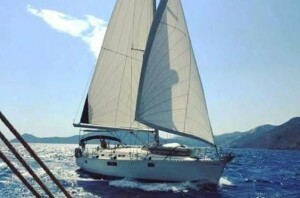 ‘Mad Max’ is an excellent example of the Beneteau Oceanis Clipper 523. She has a fantastic specification with everything needed for cruising on board her. 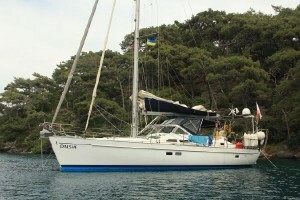 She has been very well looked after and has plenty of upgrades and additional features to show for it. 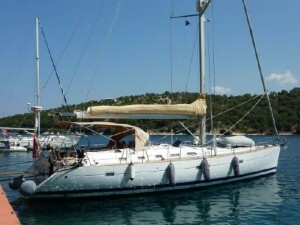 She is currently available for viewing ashore in Cyprus. We know ‘Mad Max’ very well having sold her previously in 2017, she is now back on the market after two seasons sailing with her private owners. ‘Mad Max’ is a great boat, she is very well equipped and ideal for family cruising or explorations further afield. 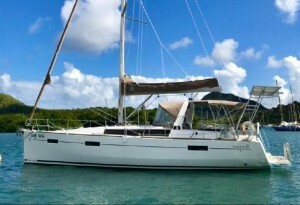 2003 Beneteau Oceanis 423 found in turn key condition. 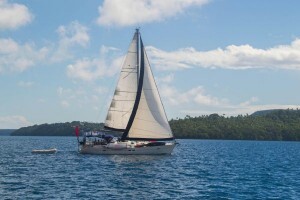 The owners of this Beneteau Oceanis 423 have completely refitted and modernised this boat spending over $120,000 to get her into great condition ready for blue water cruising. The three priorities in our boat search were speed, modernity and price and this boat had it all. It sailed on its own bottom from France to Australia and then spent a few years cruising Southeast Asia before it was sailed to California where we bought it. We then sailed it down to Mexico and across the Pacific all the way to Fiji where it is being actively cruised today. We feel really lucky having a boat as well equipped as this and know that the next owners will feel the same way. 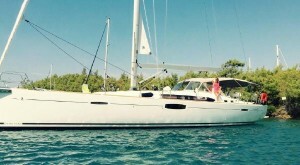 This Beneteau Evasion 32 Ketch is powered by a Beta marine 35hp diesel engine. The engine is in very good condition, with 2000 hours, shaft drive, three blade fixed propeller, PRM transmission, PSS shaft seal – pack less sealing system, and Spurs rope cutter. This Beneteau Evasion 32 features ST aluminium standing rigging, deck stepped main and mizzen masts, spinnaker pole and roller reefing genoa. Her sails are in good order and include: main sail, mizzen sail, genoa, asymmetric cruising chute, storm sails. The wheel house and saloon area of this Beneteau Evasion Ketch features a helm position with engine controls and navigation equipment. There is a U- shaped seating area with under storage, a saloon table which can be made to convert to double berth, good all round vision, and a large sun roof that does not leak. The galley is well equipped with a large fridge and separate freezer, stainless sink, two burner cooker, and easy access shelving for stores and utensils. The Diesel engine is under the floorboards in saloon with good access all round, close to the engine and electrical board are the AGM batters and charger. Storage is provided in a hanging cupboard with locker above. The cupboard also contains a WALLAS cabin heater. Forward is a further cabin featuring a double V- berth with storage beneath and an access hatch above. 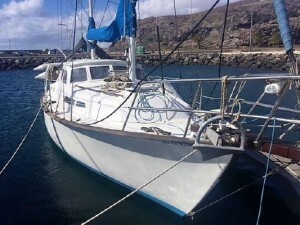 This Beneteau Evasion 32 Ketch is also equipped with a Prosure 2.9m 4-person dinghy and a Suzuki DT2.2 outboard engine. 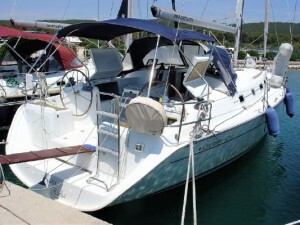 Beneteau First 40.7, 2001 – white hull. Enhanced performance Regatta version. A successful design with over 700 sailing worldwide. Full domestic package including heating and refrigerated Ice Box. EU RCD category A – Ocean. This professionally maintained First 40.7 combines a sleek and sophisticated racer with all the comforts of a luxurious cruiser. Her Bruce Farr-designed hull and powerful rig provide excellent performance on the racecourse, cruising or in port. The extra-roomy cockpit features removable lockers that provide more space and less weight for racing. 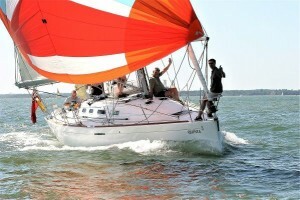 Standard equipment includes tall fractional rig, high-performance keel, and premium deck hardware. A very rewarding boat to sail, to take pride in and to own. She has provided great pleasure for me, my guests and for others. A fast responsive cruising boat that brings a smile to ones face as she powers close hauled up – wind, leaving others in her wake. Great pedigree, so she is not afraid to indulge in friendly competitive events as many of the 700 plus fleet of First 40.7s do. My own physical limitations however prevent me from now being able to enjoy her fully. Frankly she is wasted on me! QUINTA needs to find a new home with those who will cherish her as I have done. She is in great shape, ready for the next 10 years of her life. ‘Bogey’ also benefits from a 16hp bow thruster which had new gear box and valves in 2012. ‘Bogey’ features all teak decks and cockpit, and benefits from a double cockpit construction allowing guests to relax on the deck saloon while she is helmed from aft. This 2006 Beneteau Oceanis 42 CC is found fully equipped with everything that a live-aboard blue water cruiser would ask for. Bow thruster, diesel generator, watermaker, satellite TV, VHF + SSB radio, washing machine, air conditioner / heater, microwave oven, large fridge, cooler, freezer, two outboards, dinghy, Parasail… You name it, this yacht has it. This Beneteau Oceanis 42 CC has only been privately owned (2 owners) and has been looked after and upgraded to the highest standards. The maintenance records are complete, and well documented. The Beneteau Oceanis 42 CC benefits from two very comfortable double cabins along with a convertible saloon to allow for 6 guests. The Beneteau Oceanis 42CC is a safe and sea-worthy blue-water cruiser that is ready to take you anywhere. 2014 Survey available upon request. Viewings are highly recommended, to appreciate this fine yacht. This Beneteau Oceanis 440 is powered by a Perkins M60 59hp diesel engine, with 550 hours since her last overhaul in 2008. Her Wurth Marine gearbox was also new in 2008. She is driven by a shaft drive with a 3-blade Max Prop propeller. She also features a Vetus bow thruster and a Spectra 150 watermaker. This Beneteau Oceanis 440 features a Z-spars mast with in-mast furling, she is sloop rigged with stainless steel standing rigging from 2009. There are also two whisker poles with car on mast and a bow extension for the gennaker. Deck gear on board this Beneteau Oceanis 440 includes 2x Lewmar 54 winches, a Harken 40 winch and a Harken 40 2-speed electric winch. Accommodation for 6 is provided within 3 cabins. The forward master cabin features a centreline double berth, storage lockers and hanging wardrobe, and an ensuite bathroom. To aft are two further double berths with doors off of the main saloon, to port is a second guest bathroom. This Oceanis 440 features a large, open plan, saloon and galley. A large u-shaped sofa is located to starboard with a dining table. To port is a long galley. The galley is well equipped with fridge (2017), freezer (2017), 3-burner stove and oven, double stainless steel sinks, hot and cold pressurised water, and a sea water foot pump. This Beneteau Oceanis 440 is equipped with a 2.7m Seago dinghy (2016) and a 5hp Tohatsu outboard engine.